Greetings everyone, and welcome back. We begin this week with some wonderful news: That the Holy Father has designated 24 new cardinals. 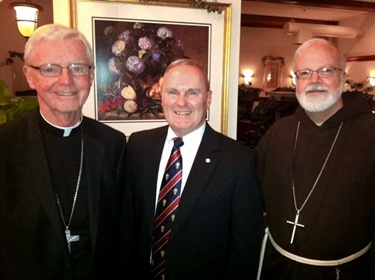 Two of them are American — Archbishops Raymond Burke and Donald Wuerl. 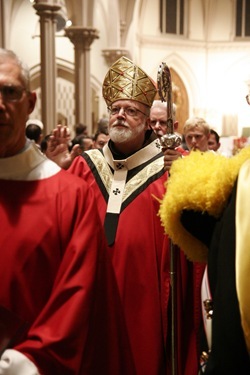 Cardinal-designate Burke had been Archbishop of St. Louis. A couple of years ago he was transferred to Rome, where he has been head of the Apostolic Signatura, which is the Vatican’s highest court. 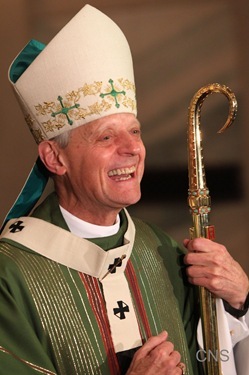 Cardinal-Designate Wuerl is the Archbishop of Washington, D.C.
On behalf of the Archdiocese of Boston, I am pleased to extend my congratulations and prayerful best wishes to Archbishops Donald W. Wuerl and Raymond L. Burke on being named to the College of Cardinals by Pope Benedict XVI. Our Holy Father has chosen these men to assist him in the important task of guiding the Universal Church. Both of them bring a deep and abiding love for Christ and His people to their new roles. 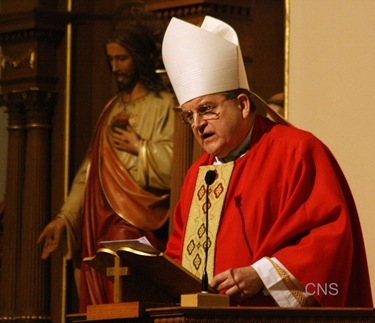 Cardinal-designate Wuerl and Cardinal-designate Burke have distinguished themselves as teachers of the faith and untiring servants of the Church. 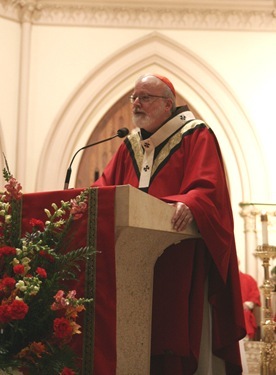 As our Holy Father calls them to the College of Cardinals, I pledge my prayerful support, and I ask the people of the Archdiocese of Boston to pray for these fine men, these great examples of priestly charity, as they assume their responsibilities as Cardinals in the service of our Holy Father and the Universal Church. 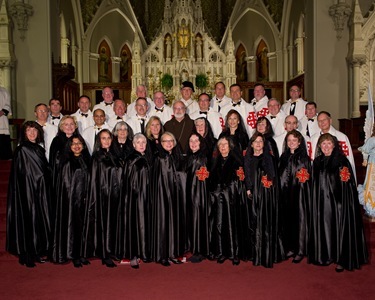 Last Thursday evening I was invited to New Hampshire, where I celebrated the Red Mass for the Diocese of Manchester’s lawyers’ guild at St. Joseph Cathedral. 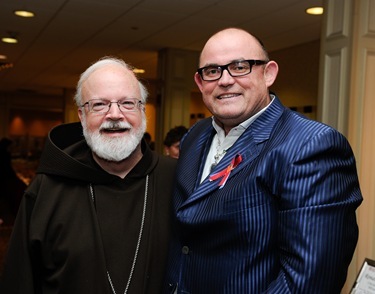 I preached at the Mass, and I addressed the lawyers at the banquet that evening, where they honored Judge Gerard Boyle with the St. Thomas More Award. This time of year there are many Red Masses to begin the courts’ new session after the summer. It is a tradition that goes back to medieval times in England when the judges attended the Mass of the Holy Spirit to invoke the guidance of the Holy Spirit on the court and legal system. It is a beautiful tradition and many Catholic lawyers look forward to participating in this Mass. The figure of St. Thomas More always figures very heavily in the celebration of the Red Mass. The Diocese of Manchester has a very strong lawyers’ guild, and I was very happy to be invited to this wonderful event. 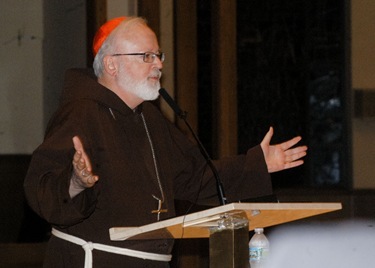 Last Friday I addressed the Franciscan Services Corporation conference which was held in Boston this year. FSC encompasses a wide range of health care ministries in Ohio, Texas and Kentucky, all under the sponsorship of the Sisters of St. Francis of Sylvania, Ohio. The Sisters and all who manage and staff their hospitals, nursing homes and assisted living facilities work to carry on the healing ministry of Jesus Christ through the intercession of St. Francis of Assisi, giving special attention to the poor and the vulnerable. It was good to have the opportunity to meet the Sisters and FSC’s leadership, including Sister Diana Eckel, Sister Mary Jon Wagner and James Pope, Presidents and CEO of FSC and to thank them for all they are doing to promote Catholic healthcare. That afternoon I went to Haverhill for a ribbon cutting at The Hayes at Railroad Square. 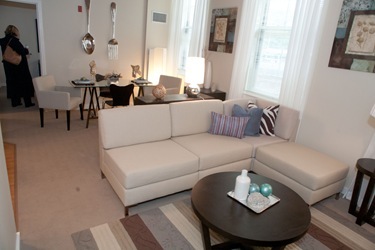 The Hayes is a new mixed-income housing complex that was developed by our Planning Office for Urban Affairs, which works to build affordable housing in cities and towns across our Archdiocese. They are such a vital force in fulfilling a social justice mission of the Church. 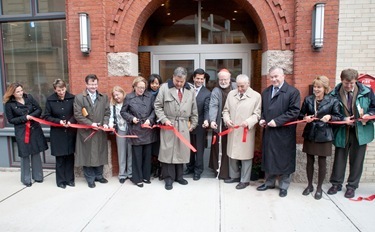 I was joined at the ribbon-cutting by planning office president Lisa Alberghini; Haverhill mayor James Fiorentini; State Senator Stephen Badour; Tina Brooks, a housing secretary in Gov. Deval Patrick’s administration; and other community and business leaders. 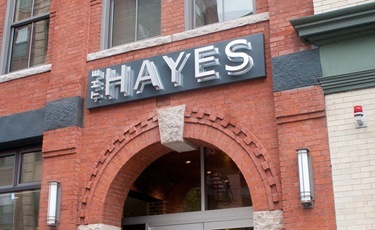 The Hayes opened on Sept. 7 in the former Charles Hayes building, which had been a factory in the late 1800’s and early 1900’s. 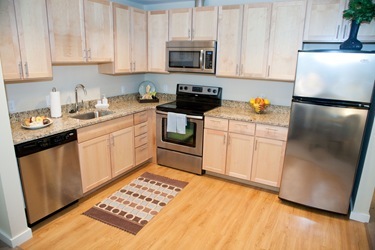 A few years ago, the Planning Office came upon this property and began the process of purchasing and then converting it into 57 beautiful newly-renovated housing units. 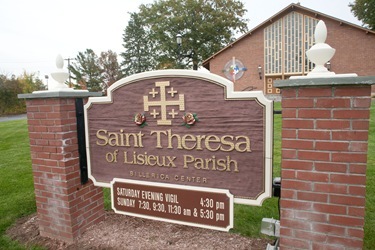 Many of the parishioners of All Saints Parish were at the ribbon cutting and, sadly, we had just celebrated the funeral of their pastor, Father Dennis Nason, who was so beloved in that community and had been a part of the planning of this project. 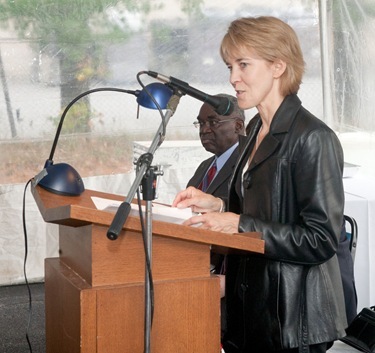 Since its founding in 1969, the Planning Office has constructed about 2,500 units of mixed-income housing and provided homes for over 10,000 people. Today the office is led by Lisa Alberghini. She and her team do such important work. Saturday morning I had breakfast with the commandant of the Coast Guard, Admiral Robert Papp and his wife, Linda. 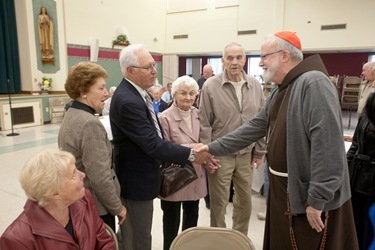 He and his wife were in Boston for a retirement party for Msgr. Bill Cuddy. Msgr. 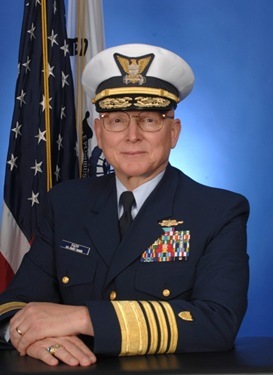 Cuddy is returning to the diocese after many years of service in the Coast Guard, where he finished his career as chief chaplain. There was a festive gathering at Faneuil Hall to mark the occasion of his retirement, and his superior officer came to Boston to be a part of it. 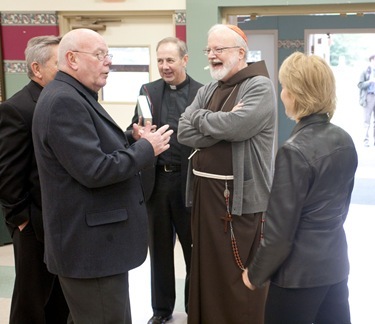 They were very appreciative of the extraordinary ministry that Msgr. Cuddy has given to the Coast Guard. We are very proud of Msgr. Cuddy and of the many Boston priests who have served in the Armed Forces as chaplains. 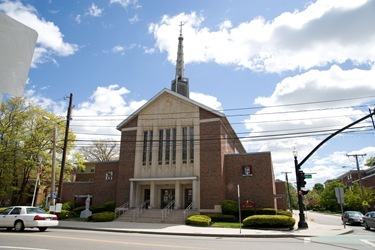 Later that day, I celebrated the funeral Mass of Father Bill Kenneally at St. Agatha Parish in Milton. 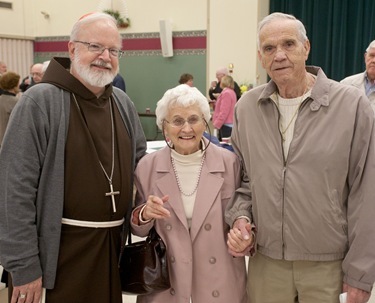 Father Kenneally had lived at St. Agatha’s after his retirement for several years until he moved to Regina Cleri, our retirement residence for priests. St. Agatha’s pastor, Father Peter Casey, preac hed at that Mass and there were many priests who came to concelebrate with us. Many of Father Kenneally’s former parishioners were also there, as well as his nieces and nephews, and great nieces and nephews. 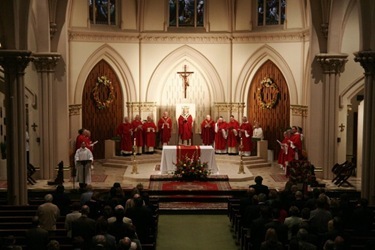 It was a beautiful tribute for a very fine priest. 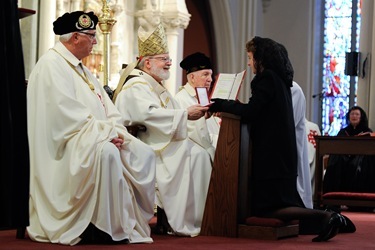 That afternoon, was the annual Mass and Investiture Ceremony Northeastern Lieutenancy of the Equestrian Order of the Holy Sepulchre of Jerusalem at the Cathedral. During the investiture ceremony, I presented each candidate the Order’s insignia and a stole. John Monahan and the new lieutenant worked very hard in recruiting a wonderful new class of inductees of Knights and Ladies. George Ryan was also there, as well as other officers of our Northeastern Lieutenancy of the Knights of the Holy Sepulchre. The Order of the Holy Sepulchre goes back to the middle ages when the pope charged them with guarding the Church of the Holy Sepulchre and Jerusalem. They are still very dedicated to supporting the Church in the Holy Land and preserving its holy sites. 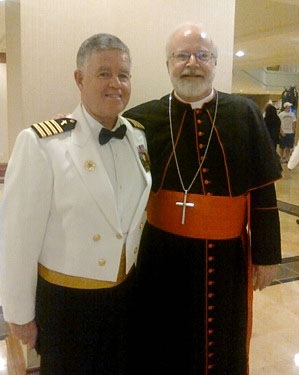 Over the weekend, the order held their annual gathering at the Newton Marriott Hotel. Where they had entertainment by the famous Irish singer Ronan Tynan. The weekend’s activities were chaired by Kevin and Cristine More, who did such a wonderful job. 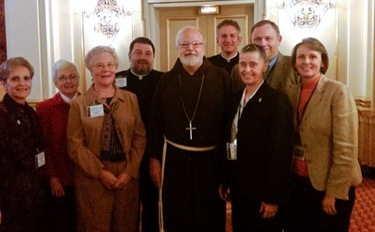 I asked them to pray for the synod in the Middle East that was taking place at the same time we were gathering. The Holy Father has placed such an importance on trying to strengthen Christians in that part of the world and trying to reach out particularly to Eastern rite Catholics. Sunday I went to St. Mary of the Assumption in Lawrence for the 20th anniversary of La Voz Católica, a Spanish-language Catholic radio station which was founded by Benny Espaillat and María Collado. 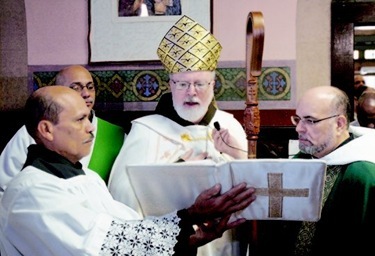 Father Jorge Reyes, the pastor at St. Mary’s, is the spiritual director. We also had the opportunity to bless the parish’s newly restored 16-bell carillion, which hadn’t functioned since it was hit by lightning several years ago. People were pleased to hear the bells ringing after so many years of silence. The Methuen Festival of Trees provided much of the funds for the restoration. The festival is held every year around Christmas to raise funds for historical preservation projects in the area. 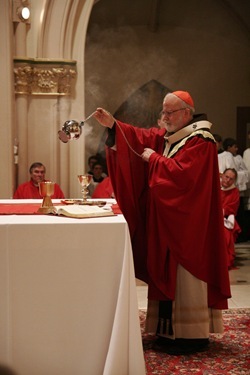 I presided at the blessing of the bells and preached at the Mass. We had, as always, huge crowds, and many young families. Father Jorge and the Augustinians are doing an extraordinary job ministering to the Hispanics of Lawrence. They had a wonderful musical program for the Mass. 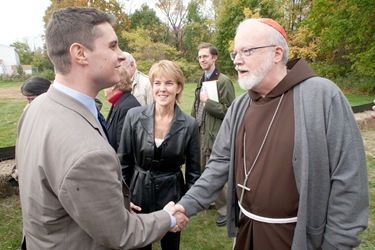 Afterwards, I went down to Needham for a confirmation at St. Joseph Parish there. There was a wonderful class of 100 youngsters. Among those being confirmed was the late-Father Dan Kennedy’s niece. 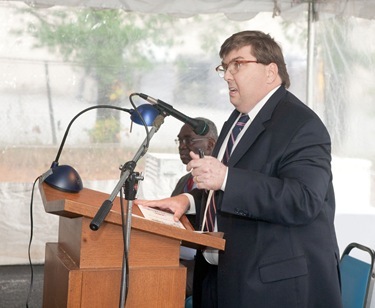 His father, Daniel Kennedy, Sr., was the sponsor. 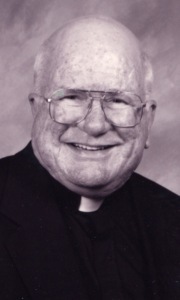 Father Paul Sullivan, as administrator, has done a wonderful job there. Also present at the Mass was their newly-appointed pastor Father David Michael. So, I told the parishioners they were getting a sneak preview of their new pastor! Msgr. Frank McGann, as the senior priest, also has been so helpful, particularly during this period of transition since Father Michael Lawlor has been transferred to a new parish. On Tuesday I went to Brooklyn, New York, where I gave the keynote address at a convocation of priests and deacons of the Diocese of Brooklyn. 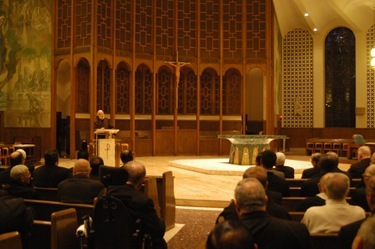 There were about 350 priests and deacons there at their seminary in Douglaston. Bishop DiMarzio had asked me to give the keynote and I began by saying it was the fourth time I had been invited to address people in Brooklyn, but the first time they’ve asked me to speak in English! 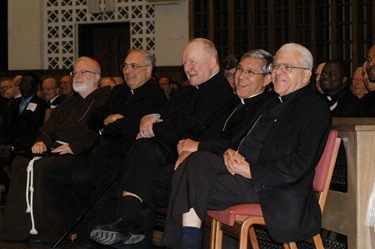 It was a wonderful event, and it was the first time they had a convocation bringing the priests and the deacons together. I think it was very well-received by all. 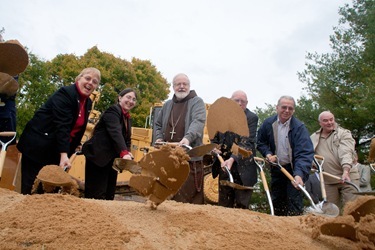 Wednesday afternoon I went to St. Therese of Lisieux Parish in Billerica for a groundbreaking for what will become Rose Hill Manor, a 41-unit low to moderate income elderly housing complex that will be adjacent to the parish grounds. This is another project of our Planning Office. Sometimes it takes years to get the financing together. 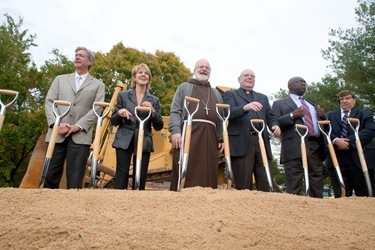 As I told the pastor, Father Eugene Tully, the actual construction is the easy part! The Planning Office does that very arduous task of getting the funding sources from many different government and private sources and brings them together. The finance council of the parish, as well as many parishioners, and the Billerica town manager, John Curran, were all there. As part of my remarks, I shared a statement from the Catholic bishops in Massachusetts that speaks of the dignity of each human person and each person’s right to a decent home. The statement also urges the state’s voters to prevent a repeal of the Chapter 40B zoning law by voting no on a referendum question in the upcoming state elections. 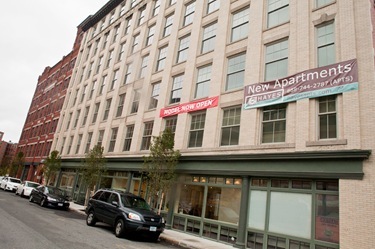 Voting no on Question 2 would preserve this important zoning law, which better enables developers to construct affordable housing units in cities and towns across the state. 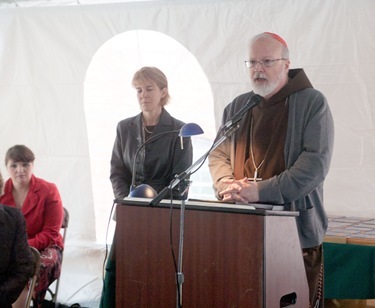 The Roman Catholic Bishops in Massachusetts have appealed to the Catholic community and to our fellow citizens to sustain the Massachusetts affordable housing law, commonly known as Chapter 40B. The stories we hear in our parishes and through our diocesan ministries are painful: families made homeless when they lose their house to foreclosure; paying high rents for apartments that are in poor condition or far from good schools and good jobs; young middle class families who cannot afford to buy homes in the communities in which they grew up; elderly residents on fixed incomes who choose between paying their rent and paying for prescription medications; and people with special needs who cannot find accessible homes. 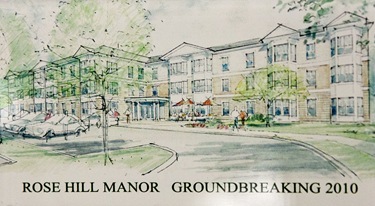 Every community needs a mix of housing in order to be healthy, vibrant and inclusive. Repealing Chapter 40B would result in the loss of a valuable tool that has prompted many cities and towns to build homes for those otherwise unable to secure adequate housing. We urge all citizens to vote No on Question Two on election day, in order to preserve our ability to provide housing for our brothers and sisters who would otherwise go without.